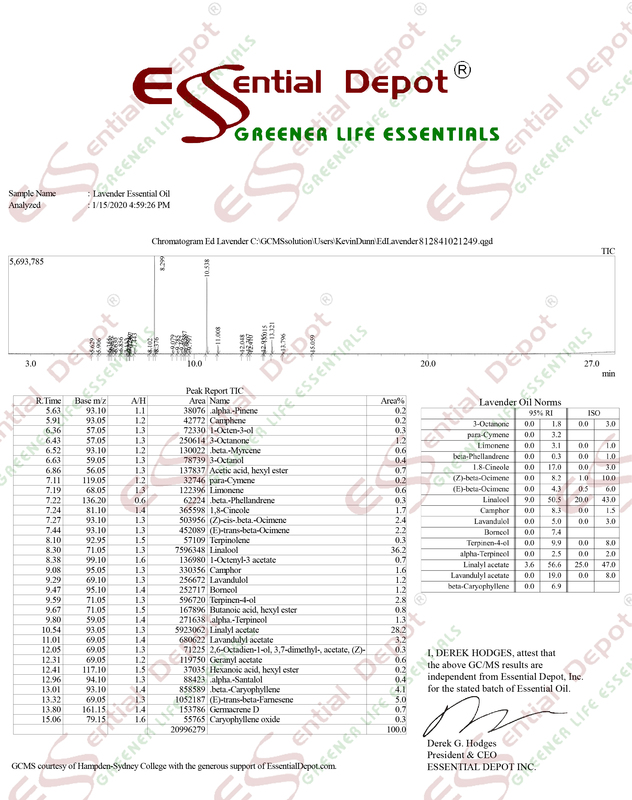 Greener Life Diamond – Bio-Healthy Score => 3 – Possible Skin Issues. The International Fragrance Association (IFRA) recommends that geraniol be limited to 5.3%, which translates into 17.5% Geranium oil (about 105 drops per ounce of any other carrier oils) for leave-on products like ointments, creams, and lotions. There is no restriction for body washes, shampoos, soaps, and other wash-off products because the oil does not remain on the skin. Geranium is a hairy perennial shrub, often used in hedgerows, and will stand up to about one meter high (3 feet) with pointed leaves, serrated at the edges and with flowers that range from red to a pinkish white. Geranium plants originated in South Africa, Madagascar, Egypt and Morocco and were introduced to European countries in the 17th century. The petals are used in gourmet jellies and confections, and the oil is widely used in scented topical applications. Geranium Essential Oil is steam distilled from leaf. Sweet, heavy aroma, somewhat like rose with a minty overtone. Geranium and its essential oil have been used in numerous alternative medicinal practices for healing wounds and fractures. It is said that the ancient Greeks used Geranium for treating skin problems. Egyptians used Geranium oil for enhancing the beauty and radiance of their skin. This plant was grown around homes in the ancient times to keep away from evil spirits. Traditionally, Africans used Geranium oil in the treatment of cholera and tumors. Native American tribes in North America used Geranium tea prepared from the root powder to enhance the body’s immune power, and to treat ulcers and dysentery. There are 250 natural species and thousands of cultivars and hybrid varieties of the Pelargonium plant family, in the genus Geraniaceae and the most popular ones are Egyptian Geranium, Reunion or the Geranium Bourbon and the Moroccan varieties. Most of the varieties have a similar structure of chemical constituents with Citronellol and Geraniol being the prevalent components. Geranium Bourbon essential oil is certified with GRAS (Generally Regarded As Safe) status by the FDA (Food and Drug Administration) as Geranium oil is mild and tested safe on individuals on a normal prescribed usage level. Using Geranium oil in a concentrated form or beyond the safe level of use might cause adverse skin reactions like mild irritation, sensitization (lower risk), rashes, allergy, irritation of the eyes and contact dermatitis. Geranium oil is non-phototoxic in nature. The primary chemical constituents that are held responsible for the adverse skin reactions of Geranium oil are citronellal and geraniol, where citronellal is reported to exhibit mild irritant effect along with sporadic sensitization and skin irritation and Geraniol is claimed for skin sensitization. The safe dermal usage level for this oil is 17.5% by IFRA (International Fragrance Association) and this safety report is based on the 30% Geraniol content, which has a maximum dermal limit of 5.3%. Research reports reveal the skin irritating effect of Reunion Geranium oil used in an undiluted manner; this oil was slightly irritating when tested on mouse skin; when tested with 5% Bourbon Geranium oil on 100 repeated dermatitis patients, the result was placid with two irritant reactions. It has also been proved that cosmetics with Geranium oil formula have caused dermatitis in hypersensitive individuals. Always blend Geranium essential oil in carrier oils like Olive oil, Jojoba oil or Coconut oil before using it topically. This is because organic and pure essential oils are extremely concentrated liquid substances that may impair the skin surface, when used in an undiluted form. Essential oils are recommended only for external use and never ingest essential oils as it can cause serious health hazards. When administering Geranium oil orally in studies, acute dermal LD50 has been witnessed in rabbits. This may also cause possible drug interactions with antidiabetic medicines and the enzyme, CYP2B6 inhibiting effect of geraniol causes drug interaction metabolized by CYP2B6. A recent study has witnessed this by testing alloxan-induced diabetic male rats with Geranium oil for about a month. The level of blood glucose was decreased by glibenclamide and the concentration of hepatic glycogen was significantly augmented. As there are no evidenced reports on the safety of Geranium oil during pregnancy and lactating, it is safe to avoid this oil for it may have an impact on the hormonal fluctuations during these special moments. It is better to keep away Geranium oil from babies, either as a massage aid or for inhalation as it can harm their sensitive and tender skin. 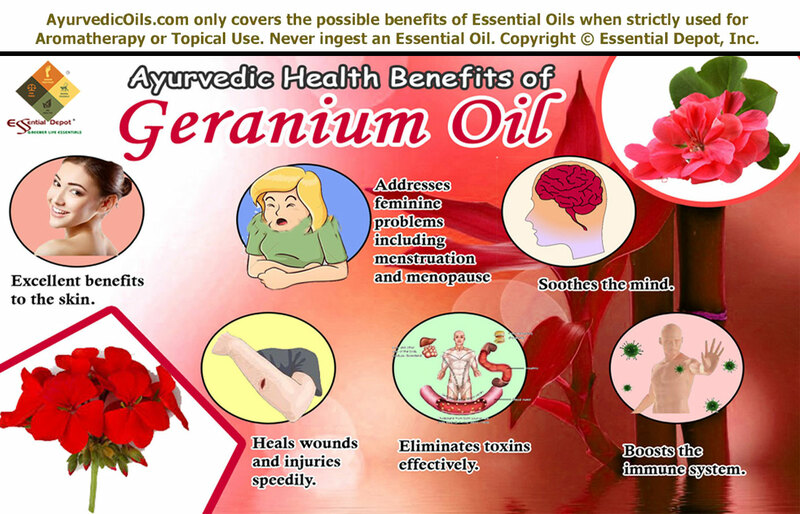 Visit AyurvedicOils.com for more information on the traditional ayurvedic and aromatherapeutic uses of Geranium Oil. Learn about the natural chemical components that give Geranium Oil its fragrance and therapeutic characteristics. Among its reputed aromatherapeutic properties are analgesic, antidepressant, antiseptic, cicatrisant, diuretic and insecticide. Calms anxiety, lifts the spirit, assists with depression. Useful for all conditions of the woman’s reproductive system as an inhalant and massage application, beneficial for PMS. May assist with menopausal problems such as vaginal dryness and heavy periods. Assists with breast inflammation. Helps clear the body of toxins and this may be helpful with addictions. Stimulates the lymphatic system which keeps infection at bay. Eases neuralgia. Indicated for all problems of the nervous system such as anxiety and nervous fatigue. The oil is a diuretic and a lymphatic stimulant which can help relieve congestion, fluid retention and swollen ankles. Useful for all skin conditions as it balances sebum. Good for oily skin. It’s an excellent remedy for burns, wounds and ulcers. Blends well with basil, bergamot, carrot seed, jasmine, lavender and rose. The International Fragrance Association (IFRA) recommends that Tagetes oil be limited to 0.01% (about 1 drop per 16 ounces of any other carrier oils) for leave-on products like ointments, creams, and lotions used on skin exposed to sunlight. There is no restriction for body washes, shampoos, soaps, and other wash-off products because the oil does not remain on the skin. Tagetes oil is said to cause phototoxic effects mainly due to the presence of limonene, just like the citrus oils. It expresses skin sensitization if the oil is oxidized and it is best to avoid oxidized and old oils. Essential oils that are phototoxic in nature can cause skin sensitization, irritation of the skin, contact dermatitis, hyperpigmentation and certain other allergic reactions. Tagetes oil should not be used on skin that will be exposed to direct sunlight within 12 hours of application. The maximum level for dermal use is 0.01% according to the International Fragrance Association (IFRA), on the parts of the skin that are exposed to sunlight and is not applicable for rinse-off products. IFRA recommends this safety level based on the unpublished study of RIFM (The Research Institute for Fragrance Materials). SCCP (The Scientific Committee on Consumer Products) suggests that, since “no safe limit of use in cosmetic products has been demonstrated”, Tagetes oil and its absolutes should be avoided for use in the manufacturing of Cosmetic products. Tagetes oil is said to cause allergic reactions like skin rashes for people who are generally allergic to daisy flowers and any other flowers from the plant family, Asteraceae, including Chrysanthemum, Marigold and Ragweed. Never use essential oils internally and for topical application, ensure that you blend Tagetes oil with gentle carrier oils, as essential oils are highly concentrated substances and may harm the skin, when used directly. Though Tagetes oil has been claimed as an oil with the lowest toxicity, studies have proved the mild irritating effects of Tagetes oil on rabbits, its allergic contact dermatitis, primary eye irritation and acute inhalation toxicity. 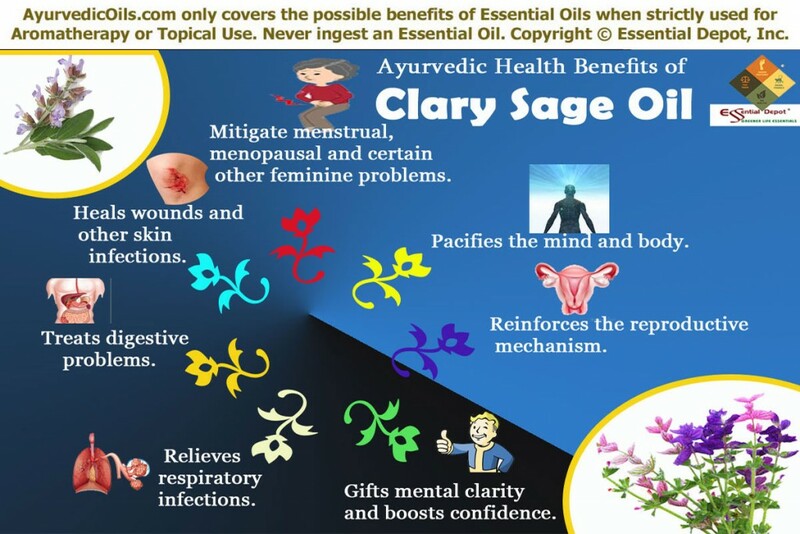 Sufficient information is not available on the safety of Tagetes oil and higher concentration might be tough to resist. So it is bestto avoid Tagetes oil on children, pregnant women and nursing moms. Tagetes by Leung’s Encyclopedia of Common Natural Ingredients, used in Food, Drugs and Cosmetics by Ikhlas A. Khan and Ehab A. Abourashed. While there are no regulatory restrictions on the use of Scots Pine oil, the oxidation products of alpha-pinene and delta-3-carene can cause skin sensitization. Pine oil should be stored in dark bottles and cool locations to avoid oxidation. The use of antioxidants in formulations containing pine oil is also advised. Originally from around the Mediterranean basin, this evergreen tree can grow up to 25 – 30 feet and the bark is a reddish-brown that is deeply fissured with needle-like leaves that grow in pairs, and pear-shaped cones. Historically it has been used in steam baths and massage oils. The essential oil of Pine Scotch is said to cause mild skin irritation, contact dermatitis, sensitization, allergic reactions and irritation of the mucous membrane. It has been certified as GRAS (Generally Regarded As Safe) by the FEMA (Flavouring Extract Manufacturers’ Association). The chief chemical components responsible for the adverse skin impacts of Pine Scotch oil are α-pinene, delta-3-carene and limonene, mainly due to their autoxidation effects. Certain studies report the effects of Pine scotch oil on contact dermatitis and sensitivity. When used in large doses α-pinene has the potential to cause irritation of the mucous membrane, kidney damage, CNS (Central Nervous System) depression, growth of benign tumors, skin sensitization, allergies and irritation. According to the Food and Cosmetic Toxicology edition (1976) by L.J. Opdyke, Pine Scotch oil sensitizing and irritating to certain individuals and is nonphototoxic in nature. When tested on repeated dermatitis patients at 2%, this oil provoked allergic reactions in about 12 members of the 1606 tested. As Pine scotch oil has the tendency to irritate the lining of the mucous membrane during inhalation, it is good to avoid this oil if you have asthma, allergies in the respiratory passages and bronchial disorders. The International Fragrance Association (IFRA) claims Pine Scotch oil as a sensitizing oil. Pine Scotch oil is recommended only for dermal use and not for ingestion. Besides being proved as an effective cytotoxic agent (fights against cancerous cells), certain studies have witnessed the renal failure, genotoxic and acute toxicity effects of the ingestion of Pine scotch oil. Never use Pine scotch oil in an undiluted form and make certain that you always blend essential oils with gentle carrier oils like coconut oil and olive oil, as organic essential oils are very concentrated and may cause negative effects on the eyes, skin and the body. Stay safe by using diluted Pine scotch oil and avoid using it on allergies, damaged skin, eyes and inflammatory skin conditions. It is better to avoid the use of Pine scotch oil if you are pregnant or nursing as there is insufficient information on the safe use of this oil during these sensitive times when the system experience enormous changes in the hormonal functions. These possible skin issues are applicable only for leave-on products like creams and lotions and not for rinse-off products like soaps, shampoos and other bath preparations. 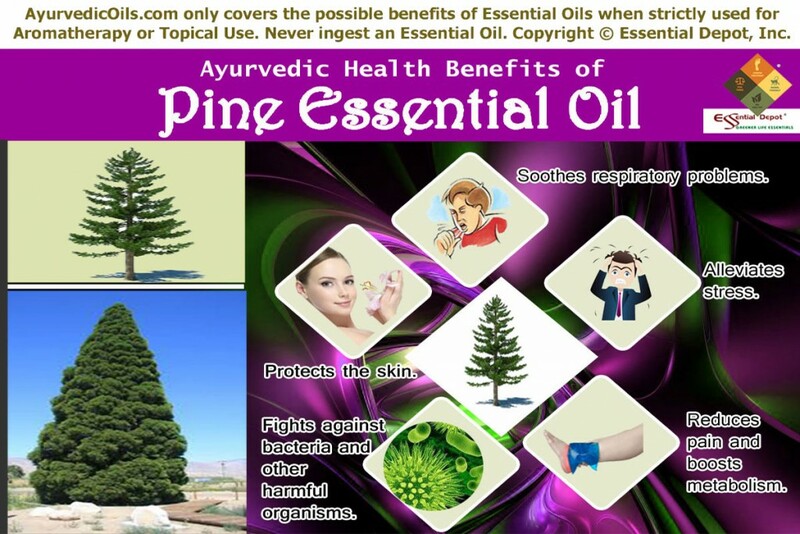 The traditional therapeutic values of Pine pinaster oil are anti-inflammatory, expectorant, restorative, stimulant, antiviral, antibacterial, circulatory, decongestant, disinfectant, analgesic and deodorant. The bark of this tree contains Oligomeric Proanthocyanidin Complexes (OPC’s) that make it an effective antioxidant that can fight against free radicals responsible for cancerous diseases. The International Fragrance Association (IFRA) prohibits allyl isothiocyanate in fragrances. Since allyl isothicyanate is the principle component of mustard essential oil, it is not suitable for use in soaps and cosmetics. Mustard oil is regarded as one of the most unsafe essential oils mainly due to the presence of Allyl isothiocyanate and erucic acid (a toxic monounsaturated omega-9 fatty acid). According to the U.S. National Center for Biotechnology Information (PubChem), Allyl isothiocyanate compound is poisonous by skin penetration and ingestion. It is also known to emit toxic fumes when exposed to high temperature. The European Union has prohibited Mustard oil as a cosmetic ingredient and the International Fragrance Association (IFRA) has forbid the use of this oil in fragrances. Allyl isothiocyanate in Mustard oil is not recommended for therapeutic use, primarily due to its toxicity, irritating nature and rigorous lachrymatory effect (potent to produce tears) that draw a question mark on the safe use of this oil in the healthcare industry. Generally, essential oils are listed with possible safe levels for therapeutic purposes but there is no viable information on the safe levels for the use of Mustard oil. The immune system of mammals reacts excessively to allergens thus generating antibodies known as IgE (Immunoglobulin). Allergic reactions are further caused when these antibodies move to cells that discharge chemicals. The most prominent adverse skin effects of Mustard oil are allergic reactions due to IgE, itchiness, redness, severe skin irritation, followed by blistering and irritation of the mucous membranes as well. Prolonged use of Mustard oil on skin might interfere the function of the skin, thus augment the loss of water of epidermis and subsequently modifying the epidermal keratinocytes structure. Few sources also state that inhaling of Mustard oil might end up in irritation of the eyes, nose, mucous membrane, respiratory system along with an obnoxious sensation in the head. Certain studies state that the topical use of Mustard oil can cause irritant contact dermatitis and other allergic reactions. It is also evidenced that this oil is linked to the development of pityriasis rosea-like skin eruption (cutaneous lesions), which was proved by patch testing. Tests on Chinese hamster cells proved the genotoxic effects of Allyl isothiocyanate and is also said to cause transitional cell papillomas and hyperplasia, when tested on male rats. Mustard oil should be strictly avoided by pregnant women as it has the potent to induce uterine contractions and may lead to unusual bleeding and miscarriage and safety measures for using this oil during nursing is also not witnessed. Mustard oil has the tendency to lower the levels of blood sugar and might interfere with your regular medications for diabetes and low blood sugar may obstruct surgical procedures, thus it is recommended to avoid Mustard oil for about 2 weeks before and after your scheduled surgery. The International Fragrance Association (IFRA) recommends that Lime oil be limited to 0.7% (about 4 drops per ounce of any other carrier oils) for leave-on products like ointments, creams, and lotions used on skin exposed to sunlight. There is no restriction for body washes, shampoos, soaps, and other wash-off products because the oil does not remain on the skin. Lime is indigenous to Asia and is now cultivated in numerous countries like America, West Indies and Italy. This evergreen tree bears white flowers and glittering green fruits. India is the largest Lime oil producing country in the world and Lime was introduced into Europe initially by the Moors and was then spread slowly to America. Lime essential oil is extracted by cold press method from the peel of the fruit. The leaves of the Lime tree were used in the prehistoric period for treating poisonous bites and swellings. Apart from its medicinal uses, Lime has been used in making pickles, sauces, desserts, jams, confections, sorbets, marmalades, beverages, squashes, perfumes, household cleaners, detergents, soaps, cosmetics and other beauty products. Lime essential oil has a photosensitizing effect that can cause irritation of the skin, allergic reactions, burning sensation, phytophotodermatitis, hyperpigmentation (change of skin color, visible especially in people with white skin complexion) and certain other effects. The photosensitizing effect can last up to 12 hours after application. The primary chemical constituent responsible for the photo-carcinogenic, skin sensitizing and other topical effects of the essential oil of Lime is Limonene and certain other furanocoumarins. A 2014 study published in the Journal of Community Hospital Internal Medicine Perspectives reveals about a skin condition called as phytophotodermatitis, induced by Lime, where a 24-year old nurse came up with red demarcated tender patches and crusted vesicles after squeezing fresh limes and going out in sun on a bright day. Phytophotodermatitis is defined as a nonimmunologic eruption of the skin that occurs after its contact with phototoxic components in certain plant varieties and is then exposed to ultraviolet A (UVA) radiation through visible sunlight. Few other studies also witness the effects of photosensitization of Lime and Lime-based products containing psoralens, paving the way for burns, blisters, bullae, eruption, erythematous vesicles, rashes, inflammation and hyperpigmentation. It is also been said that in certain severe cases, systemic toxicity come with the rashes, which includes nausea, vomiting and fever. Lime oil has also been reported to promote tumors, when tested on rats where most of the papillomas were benign and few were malignant. The safe dilution level of Lime oil is 0.7%, which is 4.2 drops per ounce of any carrier oils as per the International Fragrance Association (IFRA). This safe dilution level applies only for leave-on products like lotions and creams and is not applicable for wash-away products like soaps, shampoos and other bathing products. IFRA also suggests that Limonene rich essential oils should only be employed, provided the level of peroxides are set aside to the lowest realistic level, for example: by including antioxidants during production. Lime oil has ‘Generally Recognized As Safe (GRAS)’status by FDA (U.S. Food and Drug Administration). As per the European regulatory body, essential oils with furanocoumarins must be used in such a way that the level of bergapten should not go beyond 15ppm (parts per million) in ready to use cosmetic products after which the skin is subjected to exposure of direct sunlight and this does not apply for wash-off products. The level of bergapten should be 1 ppm in bronzing and sun protection products. For your information, Furocoumarins are also used in healing practices on par with long-wave ultraviolet light therapy for treating vitiligo, psoriasis and mycosis fungoides. 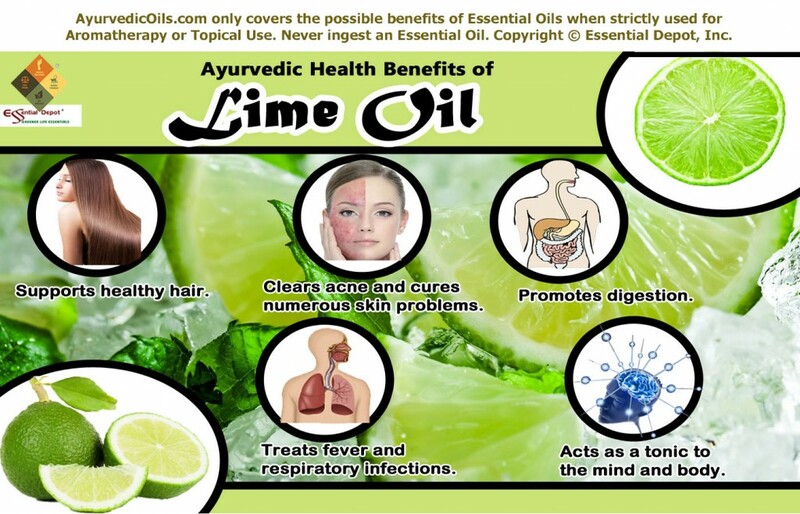 Visit AyurvedicOils.com for more information on the traditional ayurvedic and aromatherapeutic uses of Lime Oil. Learn about the natural chemical components that give Lime Oil its fragrance and therapeutic characteristics. The International Fragrance Association (IFRA) recommends that Lemon oil be limited to 2% (about 10 drops per ounce of any other carrier oils) for leave-on products like ointments, creams, and lotions used on skin exposed to sunlight. There is no restriction for body washes, shampoos, soaps, and other wash-off products because the oil does not remain on the skin. Lemon essential oil is among the photosensitizing citrus oils that may cause burning sensation, irritation, hyperpigmentation (discoloration of the skin surface) and other changes due to its effect of stimulating the photosensitivity of the skin, when exposed to visible light from the sun within 12 hours of use. The primary reason is the reaction of the photoactive chemical components that absorbs light and leads to toxicity via molecular alterations in the skin. The chief chemical component accountable for the skin sensitizing and other dermal effects of Lemon oil is Limonene and few other furanocoumarins. Certain studies (like the 1994 study on the ‘Occupation Contact Dermatitis from Citrus fruits’ and a 2006 study on ‘Skin Diseases in Workers at a Perfume factory’) on the adverse skin reactions of using the essential oil of Citrus limon reports few cases, including the incidence of allergic contact dermatitis with the use of Lemon rind oil in the workers of the perfume industry. Patch testing also witnessed certain allergic effects on using Lemon rind oil. Research reveals that Lemon oil has furocoumarin derivatives like oxypeucedanin and bergapten; however the phototoxic effect of oxypeucedanin was just 1 quarter of that of bergapten. It is also stated that these components are the major cause of concern behind the phototoxicity of Lemon essential oil. This study also states that oxypeucedanin educes photo pigmentation on the skin of colored-guinea-pig prior to visible erythema. It is also stated that the quantity of these 2 phototoxic components in Lemon oils from various countries differed by about a factor greater than 20 (bergapten, 4-87 ppm; oxypeucedanin, 26-728 ppm (parts per million), with a wavering ratio. The safe dilution use level of Lemon oil, a potential phototoxic essential oil is 2%, which is about 12 drops per ounce of any carrier oils, according to the International Fragrance Association (IFRA). This applies only for products employed for dermal use to prevent phototoxicity and is not valid for wash-off items like shampoos, soaps and other bath products. Lemon oil has ‘Generally Recognized As Safe (GRAS)’authorization by the FDA (U.S. Food and Drug Administration). As per the European decree, essential oils containing furanocoumarins can be used provided the aggregate level of bergapten does not exceed 15 ppm in cosmetic products that are ready-to-use on the skin, which is prone to be exposed to direct sunlight sans wash-away items and 1 ppm in bronzing and sunscreen products. On a lighter note, Furocoumarins are also used in remedial practices along with long-wave ultraviolet light therapy for treating psoriasis, mycosis fungoides and vitiligo. 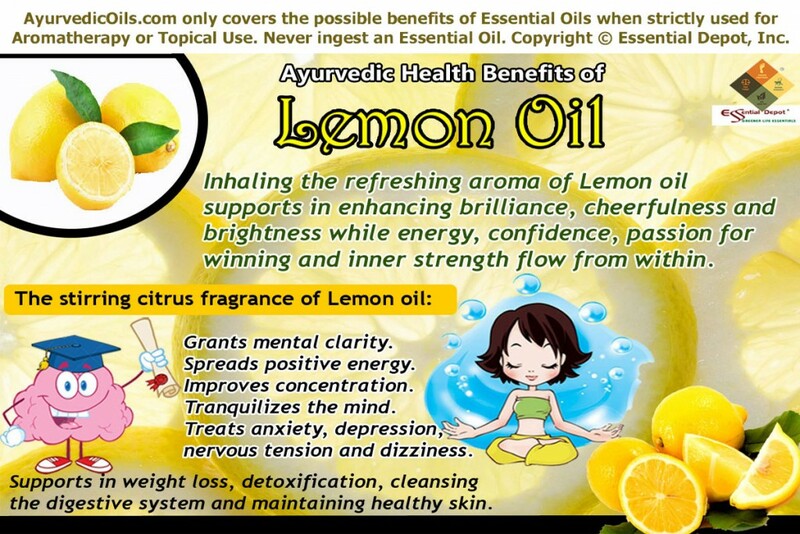 Visit AyurvedicOils.com for more information on the traditional ayurvedic and aromatherapeutic uses of Lemon Oil. Learn about the natural chemical components that give Lemon Oil its fragrance and therapeutic characteristics. Referred to as ‘Golden Apple’ in the Indian subcontinent, Lemon is a traditional remedy for many health disorders and is often called as a panacea for its ability to heal the mind and the body in manifold ways. The essential oil of Lemon is cold pressed from the external rind or peel of the Lemon fruits. Known as Nimbuka, Jambira and Dantashata in Ayurveda, Lemon is a popular Ayurvedic remedy that is used in medicine, food and also in the process of purification. It is used for stimulating the nervous system, improve concentration power, enhance immunity, purify blood and support digestion. Lemon and its essential oil is a popular ingredient of many Ayurvedic weight loss remedies and lemon juice taken with lukewarm water in empty stomach in the morning is said to reduce fat deposits and eliminate toxins from the body. The International Fragrance Association (IFRA) recommends that Grapefruit oil be limited to 4% (about 24 drops per ounce of any other carrier oils) for leave-on products like ointments, creams, and lotions used on skin exposed to sunlight. There is no restriction for body washes, shampoos, soaps, and other wash-off products because the oil does not remain on the skin. Grapefruit oil has photosensitive effects if oxidized, contributing to its phototoxic, photo-carcinogenic, sensitizing properties. The possible skin issues of using Grapefruit oil are hyperpigmentation, allergic reactions, irritation, sunburns, blisters and rashes. These reactions mainly occur when the skin is exposed to visible sunlight within 12 hours of use. The underlying reason is the reaction of the photoactive chemical constituents in Grapefruit oil that attracts light and leads to toxicity through molecular changes in the skin surface. Certain studies state that Grapefruit oil promotes the formation of tumors on the skin of mouse, by the key carcinogen, 10-dimethyl-l, 2-benzanthracene. The safe dilution level of Grapefruit oil by the International Fragrance Association (IFRA) is 4%, which is about 24 drops per ounce of any mild carrier oils. This is particularly to prevent phototoxicity in products used for dermal applications except for bath products like soaps, shampoos and other wash-off preparations. According to the European decree, essential oils that contain furanocoumarins must be used preferably when the level of bergapten does not exceed 15 ppm (parts per million) in finished cosmetic products intended for use on parts of the skin that are in contact with sunlight (other than rinse-away products) and 1 ppm in bronzing and sun protection products. Grapefruit oil should be used only for topical application, preferably blended with mild carrier oils (good for use after a patch test on your skin). Never use essential oils for ingestion, as internal use of essential oils might pose adverse health effects. Undiluted Grapefruit oil can cause skin irritation and this oil is claimed to be toxic to cats. Studies state that ingesting furocoumarins may also cause phytophotodermatitis. It is better to avoid Grapefruit oil if you are pregnant or breastfeeding as the safety of this oil during carrying or nursing are not established. In a much similar way like Bitter orange oil, Grapefruit oil is said to restrain important enzymes in the intestines and liver, leading to have an impact on the blood levels at the time of taking medicines that are antidepressant, antiviral, anti-anxiety, calcium channel blockers, steroids, anti-malarial, immune modulators, prokinetics, statins and on par with caffeine intake. The presence of furocoumarins has led to the term ‘Grapefruit effect’, which signifies the interaction between furocoumarins and enzymes that are engaged in drug metabolism, specifically cytochrome P450. Use Grapefruit oil only after medical advice, if you are taking any other prescription medicines. Startlingly, furocoumarins are also used in different remedies along with long-wave ultraviolet light therapy for treatng psoriasis, mycosis fungoides and vitiligo. 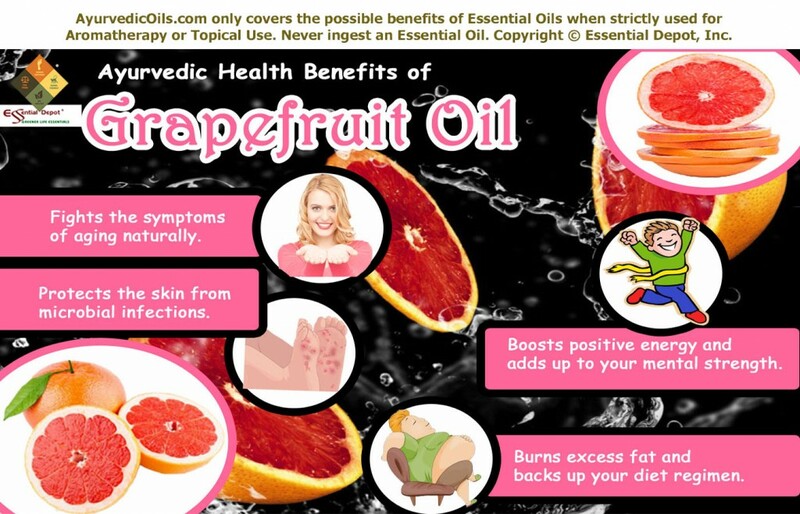 Visit AyurvedicOils.com for more information on the traditional ayurvedic and aromatherapeutic uses of Grapefruit Pink Oil. Learn about the natural chemical components that give Grapefruit Pink Oil its fragrance and therapeutic characteristics. The traditional remedial values of this oil are antidepressant, antiseptic, anti-tumoral, antioxidant, lymphatic, stimulant, tonic, diuretic, disinfectant, aperitif and fat dissolving. The International Fragrance Association (IFRA) recommends that Cumin Seed oil be limited to 0.4% (about 2.4 drops per ounce of any other carrier oils) for leave-on products like ointments, creams, and lotions used on skin exposed to sunlight. There is no restriction for body washes, shampoos, soaps, and other wash-off products because the oil does not remain on the skin. 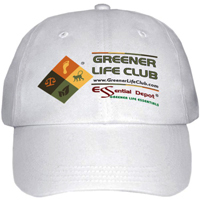 Learn more about the Greener Life Diamond and the benefits of the Greener Life Club. Black seeds or Nigella sativa is an annual flowering plant and is indigenous to southwest Asian countries. The earliest archaeological evidence about this medicinal herb is said to have been found in the ancient Egypt in many places including the Tutankhamun’s tomb, where the Egyptian Pharaoh of the 18th dynasty was entombed with Black cumin seeds. The National Association For Holistic Aromatherapy (NAHA) cites Cumin oil as a photosensitizer and dermal irritant thus it is always recommended to use in a diluted form and should be avoided on damaged skin, eyes, allergic skin conditions and inflammatory parts. Avoid Cumin oil if you are pregnant or getting ready to conceive as Cumin oil has abortifacient and anti-fertility effects, when used more than the prescribed level can end up in miscarriage, stimulate menstruation or premature labor and might delay the chances of getting pregnant. 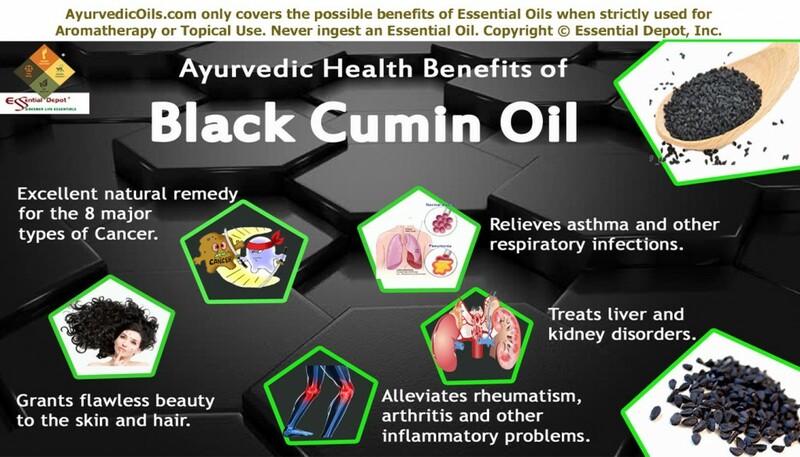 Visit AyurvedicOils.com for more information on the traditional ayurvedic and aromatherapeutic uses of Black Cumin Seed Oil. Learn about the natural chemical components that give Black Cumin Seed Oil its therapeutic characteristics.